If you want to see Alaska like a local and access wild places that make your heart sing, then this is the adventure for you! 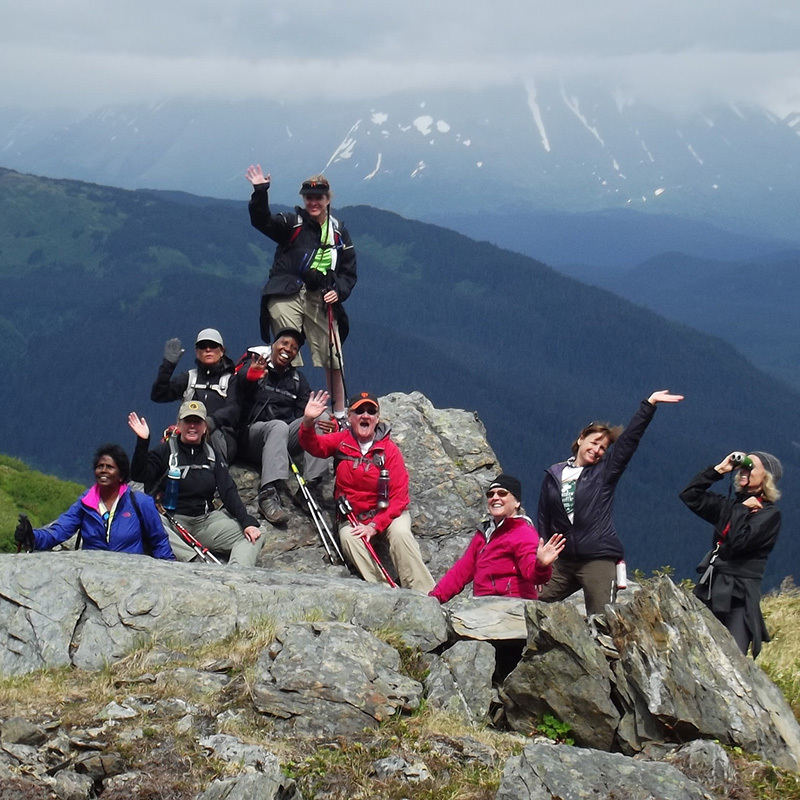 This Alaska women’s hiking trip and multi-sport adventure begins in Anchorage. 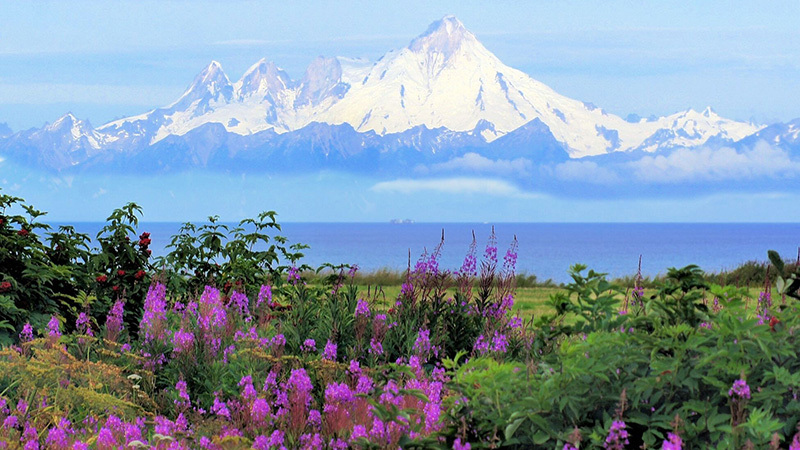 From there, we travel south to Seward for spectacular hiking on Mt. 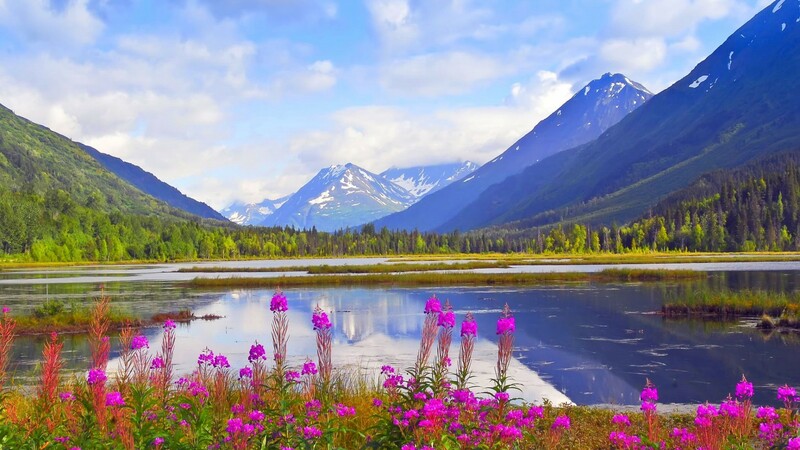 Marathon, and the Kenai Fjords’ famous Harding Icefield Trail which provides hikers with a view of the vast icefield that feeds all of the glaciers in park. We will get a chance to see the National Park from the ocean side on a 6-hour glacier and wildlife cruise with ample opportunities to photograph wildlife like humpback whales, puffins, and sea lions. Our home for 3 nights will be on cabins near Lake Kenai. The second half of the adventure puts the glaciers in our rear view mirror as we traverse the Kenai Peninsula to Homer. From Homer, we board a water taxi and cross Kachemak Bay to Otter Cover. For the next two nights, we enjoy the seclusion of this remote location with hiking and kayaking activities. The final day, we cross back over Kachemak Bay, head east toward Anchorage, and stop for a thrilling river rafting trip on Six Mile Creek before ending our adventure in Anchorage that evening. 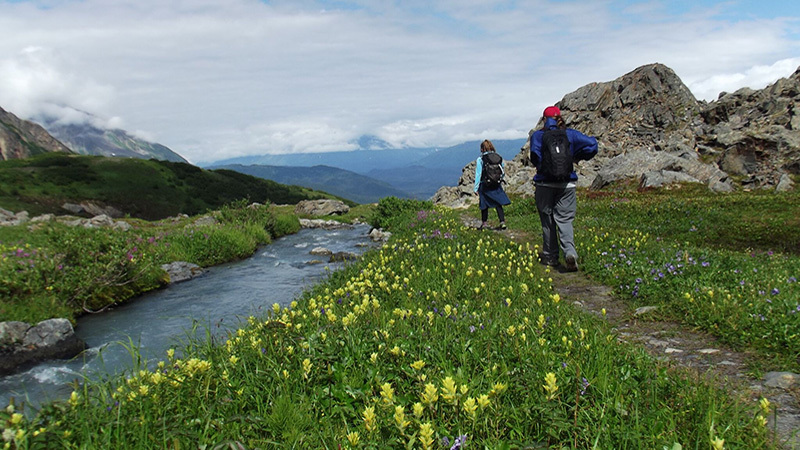 This Alaska trip for women is designed for women who like to hike and who enjoy the challenge of exploring a place by the power of their own steam. You don’t have to be an athlete to do this trip. There is a plan B for most of the activities, so please let us know if you have any questions or concerns before you sign up. How strenuous is strenuous? We walk an average of 5-9 miles per day under 2 miles per hour. Our longest hike is 9 miles round trip and over 3200 ft in elevation. It will be challenging, because you gain about 1000 ft of elevation with each mile. but you will be encouraged with by a great group of adventure buddies, and rewarded with stunning views the entire way. The Mt. Marathon Bowl Hike is 5 miles round trip over 1900 ft. The rest of the hikes are under 1000 ft in elevation and between 3-4 miles. A variety of exceptional 2 to 6-hour scenic day hikes over mixed terrain that will reward you with breath-taking scenery. 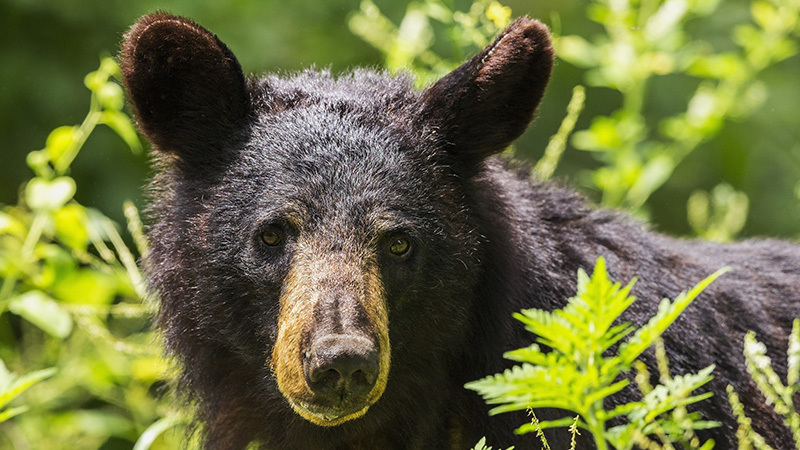 Make sure you bring a camera for excellent wildlife viewing opportunities throughout the trip. Replenish your appetite with great food! Fresh, homemade, multicourse meals and deserts. 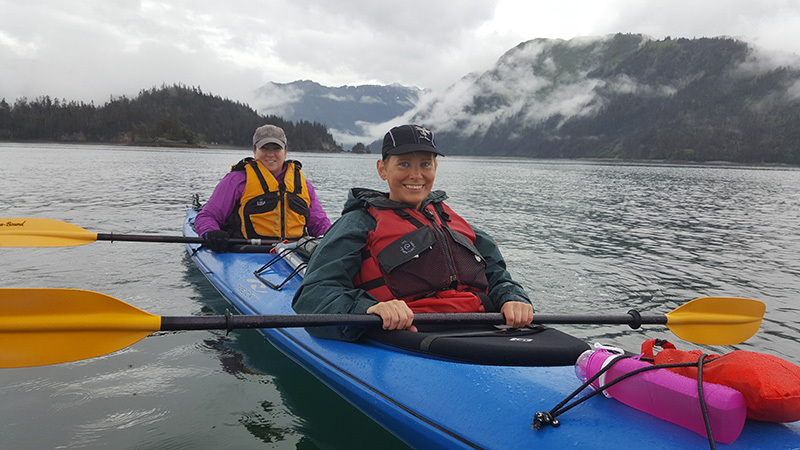 Dip your paddle in emerald green wildlife-rich waters of Kachemak Bay while sea kayaking among diving sea birds, curious seals, and shy otters. An evening trip to the Sea Life Center will introduce you the ecology of Alaska’s marine life and some of the conservation efforts around Alaska. 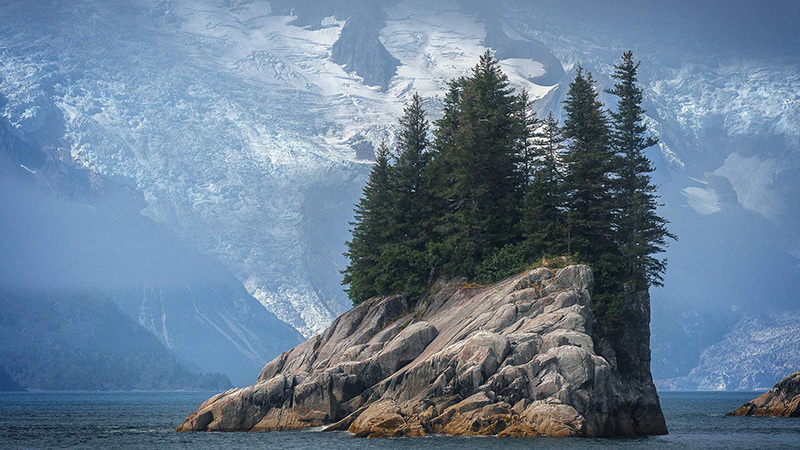 A 6-hour boat trip into the wild Kenai Fjords to see calving glaciers, whales, sea lions, and marine birds. A thrilling roller coaster ride on whitewater through narrow canyons and over natural steps on the Class IV Six-Mile Creek. Arrive anytime. Your first night will be at the Inlet Hotel in Anchorage. The Inlet Hotel has a free shuttle to and from the airport. Breakfast is included. Dinner on your own. Once everyone’s flight times are confirmed those of us in Anchorage for dinner can get together. Most flights get in late from the lower 48. After an early breakfast, our local guides will meet us for introductions, then we will head south to the beautiful Kenai Peninsula. Our drive will parallel the scenic Turnagain Arm — a mountain-lined and glacier-carved fjord named by an obviously frustrated Captain Cook during his 1778 search for the legendary Northwest Passage. It is a 3-hour drive with a couple scheduled stops to talk about the scenery and to use the bathroom. Just outside of Seward we venture off the main highway to the Lake Kenai where we check into our cabins and freshen up. From city streets to alpine tundra in 2 hours! Travel up 1800 feet to the alpine glacier bowl passing through lush, misty emerald green temperate rainforest. Things level out at “the bench” where wildflowers bloom, and then alder becomes thick, and finally the footpath becomes squishy tundra flanking a snowmelt creek. As we climb the switchbacks, Seward becomes a little dot in the valley. On a clear day, half way up, nearly all of Resurrection Bay can be seen. Even on the cloudiest of days, this is a one of the best hikes in Seward. This hike is about 3.5 – 4-hours roundtrip. Today you rest your legs and take a six-hour wildlife-viewing cruise to an active tidewater glacier on Kenai Fjords National Park. A tidewater glacier terminates in the ocean. It is common to see chunks the size of cars falling off into the green water. Wildlife is abundant throughout the national park and tidewater glaciers. 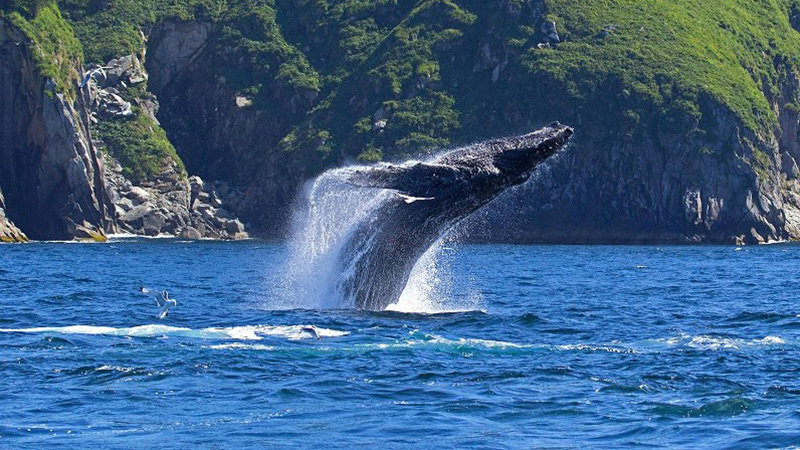 This voyage also offers the best opportunity for whale watching in Alaska along with the possibility of seeing porpoises, sea lions, sea otters, seals, bald eagles and puffins. Before returning to our cabins, we will visit Exit Glacier to discuss the hike to Harding Icefield tomorrow, and the features of this famous glacier. One of our favorite hikes anywhere, is today’s highlight: Up we’ll trek along the very blue Exit Glacier to an overlook of the 800-square mile Harding Ice Field. 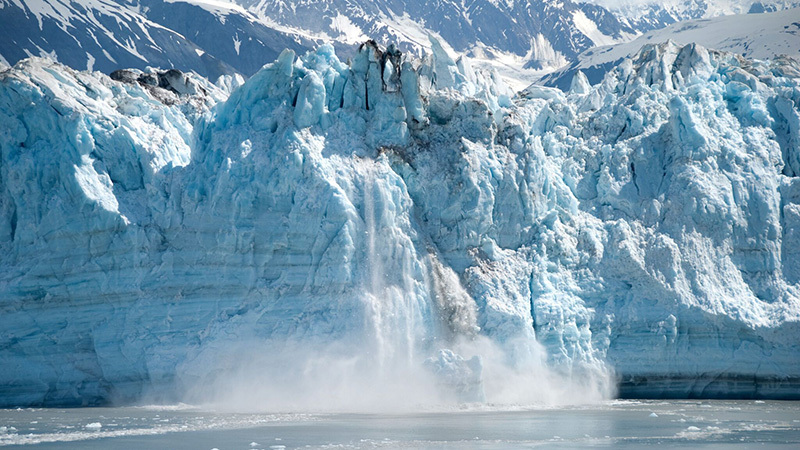 The ice field is the focal point of Kenai Fjords National Park and the source of its many glaciers. 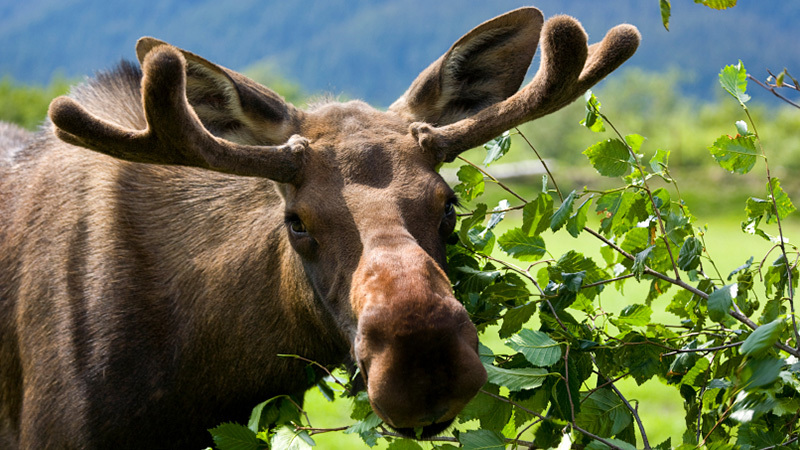 Moose, bears, mountain goats, porcupines, and marmots are all commonly seen on this hike and the glacier and ice field are dramatically beautiful. 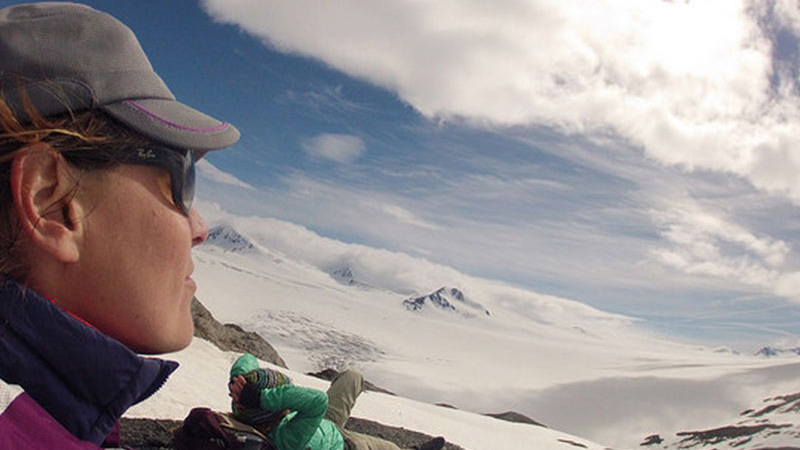 This inspirational hike will stay with you long after you’ve left Alaska! This hike is moderate to strenuous for flat landers and for those who are not currently active, but with effort and determination you will complete the 8 miles round trip in 6 hours. This is not a technical hike and it is suitable for anyone in good health with a positive-can-do-attitude. Return to cabins at Lake Kenai. After breakfast, we drive 3 hours to the seaside community of Homer at the peninsula’s southwestern tip. Here we will have some free time to visit the town’s museum and art galleries or to hike along the beach before hopping a water taxi to our remote waterfront cabins in Kachemak Bay State Park. 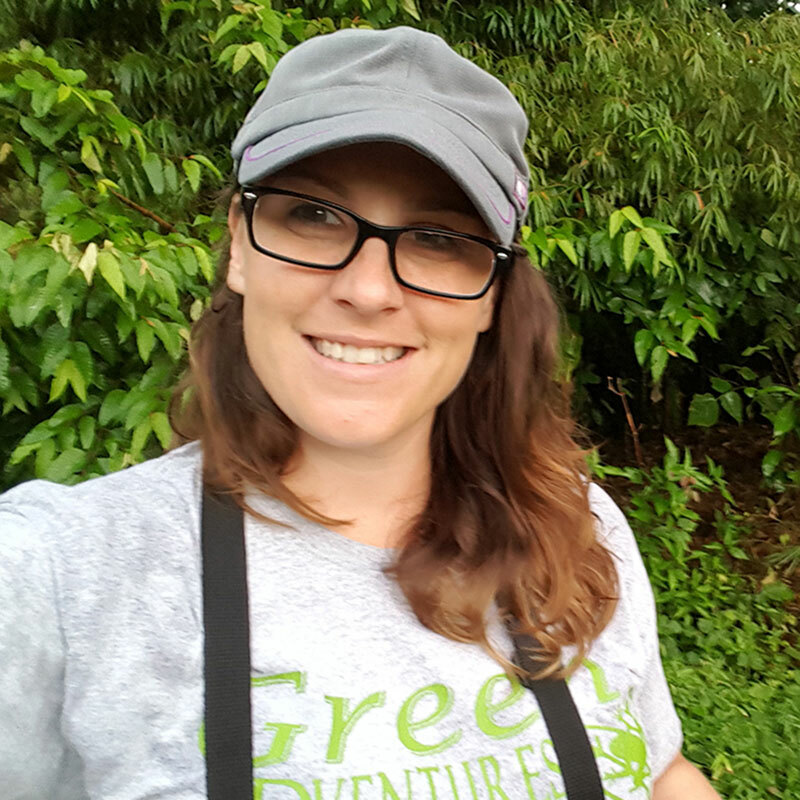 The cabins at Otter Cover are situated on a hillside surrounded by lush rainforest with ocean views. It is common to see sea otters rolling around alongside the pier, and you will possible see whales passing by. You truly feel like you are living the luxury of seclusion. Learn the basics of sea kayaking, maneuvering, and water entry and exit. Then spend the entire day in and out of our tandem kayaks as we explore the bay, fjords and several uninhabited islands. In addition to beautiful mountain scenery, sea otters, harbor seals, sea lions, bald eagles, sea birds and harbor porpoises are all possible to encounter. The afternoon a hike to a scenic overlook where several of the volcanoes of the Alaska Peninsula and Aleutian Islands are visible. We take a water taxi back to Homer and continue to the gold rush community of Hope. 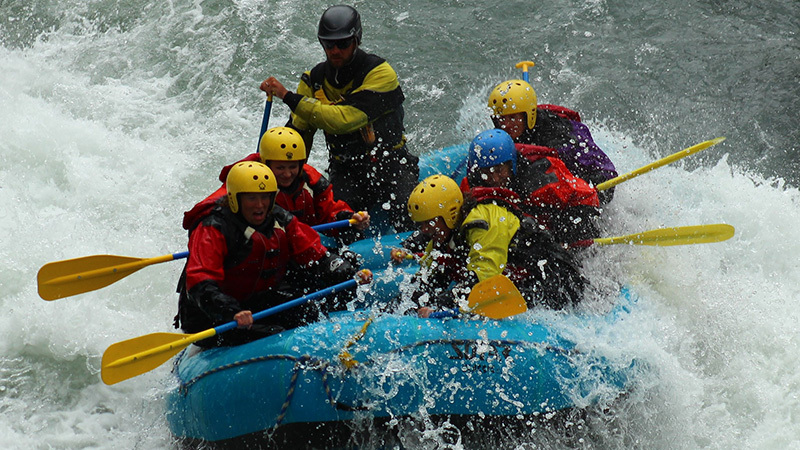 Here we will enjoy a Class IV whitewater rafter trip through two canyons of the famous Six-Mile Creek. For those who love the thrill of adventure, you can choose to do the 3rd canyon for an additional $60. Tour ends at 7 pm. Participants will be dropped off at the airport or hotel in Anchorage. All scheduled activities: guided hikes, 6-hour boat tour, river rafting, kayaking trip, and entrance to the SeaLife Center. Transport in a 15 passenger van for the duration of the trip. Most meals from breakfast day 2 to lunch day 7. Excludes 2 dinners. Meals are served camp style, prepared by your guide, with the help of participants. Optional excursions or museum entrances. Gratuity of $200-$220 per person due to local guides. Deposit due by: January 15th, 2019 or until spaces are filled.